When I was maybe three or four years old, my mom would drop me off at the house of a woman that would watch me for the day. She had two sons, who were a lot older than me. The younger of the two, who was maybe 9, figured out a really clever way to keep me distracted. He would turn on his Sega Genesis, hand me the second controller, and promptly start playing a one-player game. I was convinced that I was doing something, so it felt like we were playing the game together. He continued to encourage me like I was really accomplishing something. It was pretty clever. It wasn’t long before I had the opportunity to actually play. In kindergarten, the system I was constantly exposed to was the Gameboy. It seemed like everyone had one but me! Of course, in retrospect, I don’t think many of my classmates had one at all. There would be one or two of them people had brought to SACC after school and we would huddle around them and hope the owner would let us have a turn. I can’t remember if it was for my birthday or for Christmas, but I got my Gameboy, the first system I ever owned, when I was just five years old. This was so long ago and I was so young that I get the chronology kind of screwed up in my head in terms of what games I got when. 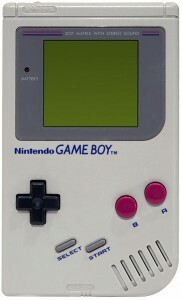 Based on the year that I got the Gameboy, I’m pretty sure my first game was Super Mario Land. 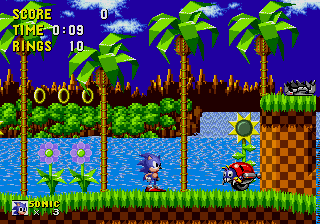 I definitely remember playing it, getting stuck on specific parts, and doing them over and over until I finally advanced or ran out of lives. The last level in particular game me trouble. 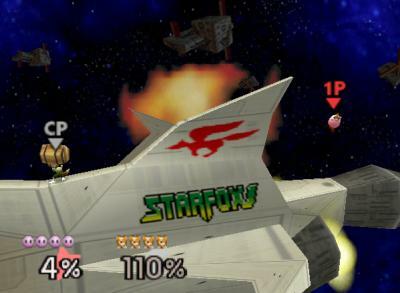 In it, Mario is flying around in an airplane–in space(? 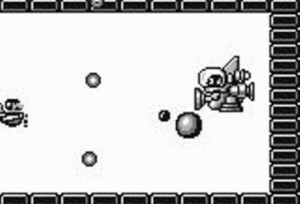 )–where he fights some alien who never really made it to King Koopa level infamy. I acquired a ton of Gameboy games when I was in elementary school, ranging from Teenage Mutant Ninja Turtles II, Tetris, Looney Tunes, and Link’s Awakening, the very first Zelda game I ever played. 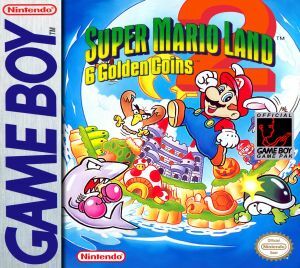 The game I remember with the most nostalgia is Super Mario Land 2: The 6 Golden Coins. There was this sixth grader, Tron, who had it. We would all sit around Tron and watch him play, and sometimes he’d let someone jump in. I wanted it. I wanted it with the intensity that only a little boy who has fixated on something can muster. It may be a little sad, but I will probably never be as excited about any material thing ever again as I was when I unwrapped a present that Christmas and discovered it was that game. Not because the game itself was so intrinsically amazing, but because I was a 7-year-old, I wanted it so badly, and I got it for Christmas. My grandparents got me the game on Christmas Eve. I was much more eager to start playing the game than I was to find out what other presents I was getting. So when I woke up Christmas morning, I just started playing it, and assumed that my parents would come get me when it was time to get up. Well, my mother noticed my light was on and popped in to tell me to go to sleep, because it was three in the morning. I can’t think about the joy I felt about Christmas as a kid without thinking of what it was like to get and play that game. After I got back to school, Tron was still playing the game, but he was stuck on one part–the Space Zone. Which I just so happened to have beaten over the Christmas break. He couldn’t believe that some kid was better at the game than he was, so he made me prove it. So, I did. I got the next game in the series when it came out (“it’s the first game ever where you get to play the bad guy!” I told my dad with excitement, “yeah, that sounds great” he replied with dripping sarcasm). 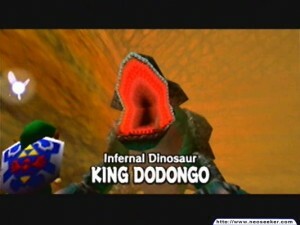 With it, my grandmother got me a subscription to Nintendo Power magazine. 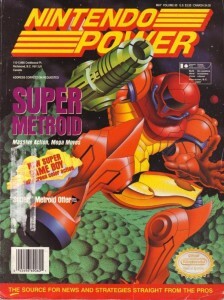 It had the next to last installment of a Super Metroid comic miniseries, which got me hooked right away. I read every single issue of Nintendo Power for years. It was, in fact, the only magazine that I ever had a subscription to. That magazine was instrumental in turning me into the kind of gamer that I would be until I was in college. There were PC gamers, and the Sega and Sony faithful. I did play the occasional PC game, such as Age of Empires and Starcraft, and I would play other consoles at my friends’ houses. But for many years I was a dyed in the wool Nintendo fanboy; and I never owned any other brand’s console. In retrospect, Nintendo Power dished out a lot of what was basically propaganda, and I ate it all up. When I was 9, my dad got the opportunity to do a stint at the embassy in Paraguay the following year, so my parents wanted me to start learning Spanish. My incentive for reaching a certain goal (memorizing “Cultivo una Rosa Blanca“, and explaining what it meant) was that my parents would get me a Super Nintendo. Needless to say, I made damn sure I met that goal! It came with Donkey Kong Country, which I found particularly exciting because Nintendo Power hadn’t just covered it, they sent a video promoting it! I played a ton of SNES games over the years. There was Mortal Kombat II, Street Fighter II, Earthworm Jim, ClayFighter, Super Metroid, and many more. While we were in Paraguay I ended up unwittingly acquiring three games that were Paraguayan-made fakes. The first was the original Super Mario Kart. I could tell something was amiss, as the box was entirely in Japanese except for a bit on the back which read “To be sold exclusively in Japan” or something to that effect. The game was entirely in Japanese–but I played the hell out of it anyway. The others were Toy Story, and Earthworm Jim II. The latter was the real tragedy, as it just did not work right. I had borrowed a friend’s copy and really wanted one of my own, but the thing just glitched out after a few minutes. The Nintendo 64 came out right around the time that we would be coming back from Paraguay, so I started saving up my allowance. I opened my very first bank account in order to buy the N64. I was 12 years old at the time and needed to make it some sort of joint account with my mom for it to even be legal. 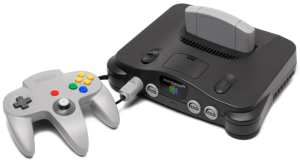 But I saved up enough eventually and the N64 became the first console I bought with my own money. I explored every nook and cranny of Mario 64. Which really just meant that it vibrated every so often in response to something that happened on the screen. I’m not ashamed to admit that my 12-year-old self watched that video like five times in anticipation of getting the game. I had seen the original Starfox played by the older brother of a friend of mine–we used to sit and watch him play games all the time, back before I had a Super Nintendo of my own–and I still hold a special place in my heart for Starfox 64. The nature of the game was such that there were a bunch of different paths you could take to beat it, and I eventually explored them all. I played it again recently for the first time in years and found that I could still beat it in less than an hour. Like riding a bike. Another favorite of the N64 era was Super Smash Bros, arguably one of the most original fighting games in its mechanics. Sophomore year in High School, a couple of guys I knew from school would come over to work on our Government class project. Instead of working on that project, we listened to Adam Sandler tapes and played Smash Bros. Those two guys are both going to be groomsmen in my wedding; so the game has a bit more sentimental value than most for me. 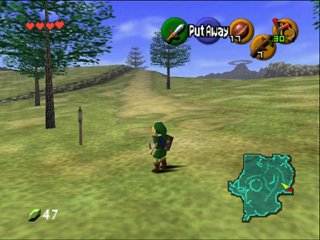 The game that is inextricably linked with the N64 in my mind is The Legend of Zelda: Ocarina of Time. 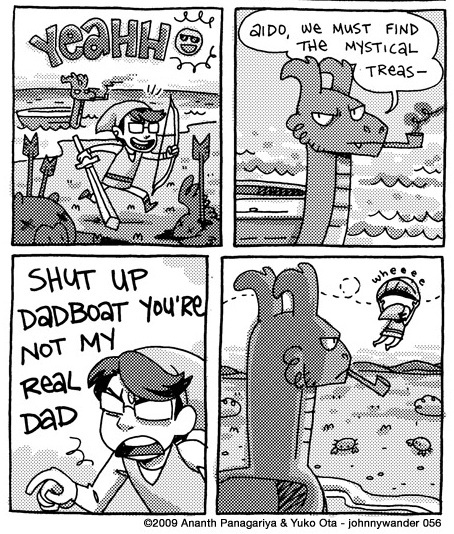 The very first Legend of Zelda game I ever played was Link’s Awakening for the Gameboy. Which is funny, because it’s a very peculiar game in the franchise–for one thing, Zelda isn’t in it, at all! For another, the Gombas of the Mario universe make a random appearance. Regardless, I absolutely loved the game, though it took me forever to beat. Even more than Mario, the Legend of Zelda franchise acts as a reference point for every console I’ve ever owned. The only exception is the Super Nintendo; I did play A Link to the Past but many years after I got the console, and many, many years after it came out. I can’t even remember how far back rumblings about Ocarina of Time started. 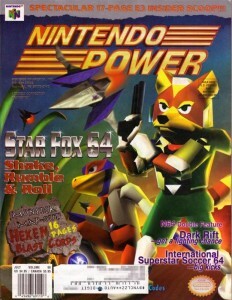 All I remember is the teaser screenshots that Nintendo Power seemed to offer what felt like every month for years. Consulting Wikipedia, it seems I’m not exaggerating–it was teased in 1995 and didn’t come out until 1998. Getting Ocarina of Time was the second most excited I’ve ever been to get a game, after Super Mario Land 2. Once again, I got it as a Christmas gift. I have a distinct memory of my dad coming down to the basement, Christmas Day, and watching me play it. He commented on how amazing the graphics were. Of course now it all seems so blocky compared to what came after, but that memory of my dad’s remarks are like a snapshot of one moment in the progress of gaming graphics. There was something about Ocarina that just captured people’s imaginations. I’ve seen people argue that various Zelda games were superior in one or more dimensions, and most of the time I get where they’re coming from. But Ocarina just had some quality that’s hard to put your finger on that made it fun, that makes people want to go back and play it all over again. 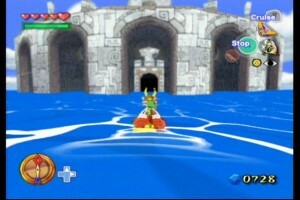 And what gamer of our generation doesn’t instinctively feel hatred at the words “Water Temple”? Many years later, the summer after I graduated High School, I used it to get my friend Kelly into gaming. She was content to watch me play through it to begin with, as she enjoyed the storyline. Then she had a go at it. I think every gamer at some point in their life has the experience of trying to get a non-gamer into it. It always starts out incredibly frustrating, because everything that seems obvious and intuitive to you turns out to have been something completely learned, and the only way to learn it is with experience. There is no quick way to gain experience, so you watch as they walk off cliffs or respond to some new stimuli in a way that seems completely inexplicable to you. Kelly crossed the threshhold, and became one of my closest gaming buddies. These days, she’s gaming a lot more than I am. In fact, she’s played the latest Zelda game, and I have not! 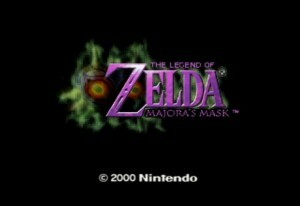 The sequel, Majora’s Mask, doesn’t get nearly as much attention but I had a blast playing it. I think a lot of people were expecting more of a straightforward sequel to the narrative of Ocarina, and Majora disappointed them in that. Still, as a standalone game I think it’s pretty solid. 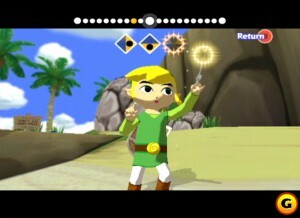 Wind Waker is one of the few games for the Gamecube that I really remember. Nintendo went with an aesthetic that was drastically different from the previous two games, and the choice was quite controversial at the time. I thought the look of the game was fine, and it really is a very fun game. I remember a reviewer at the time saying that it had the potential to be the best of the Zelda games, if you didn’t have to spend a cumulative million years sailing from place to place. 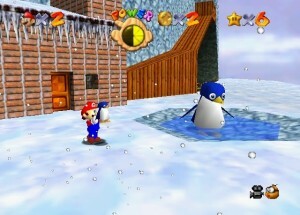 It was probably the best game that came out on the Gamecube, though. There weren’t many memorables ones, unfortunately. Others included Tales of Symphonia, Mario Kart: Double Dash, Soul Caliber II, and Smash Bros. Melee. 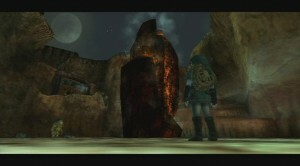 The last real Zelda game that I played was Twilight Princess, which came out when I was in college. It was designed for the Gamecube, but didn’t come out until the Wii was on the market–so I played the version for the Wii. 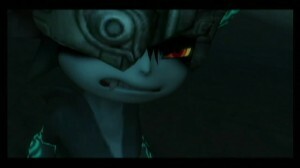 In the end Twilight Princess is probably my least favorite of the Zelda games listed here. There was nothing wrong with the game itself; though I found it much too easy to beat. Maybe if it was the first of them that I had played, rather than the last, I would feel differently. I do have some good memories around it–I played this with my friend Sam in Kelly’s dorm during the day, when we were between classes and she was off working. Sam would leave his Wii and his copy of the game in her dorm after he went home, resulting in a great deal of distraction from class and studying on her part. She ended up beating his copy of the game before he did! I commuted to college, which in practice meant I ended up spending most of my time hanging out in my friends’ dorms and off-campus apartments. This meant the consoles I ended up playing were whatever they had, and nine times out of ten this meant it was a Playstation 2. Three games really stand out in my mind from this time. The first was Soul Caliber II, which a friend I got ridiculously competitive over. It was, in retrospect (and maybe even at the time), pretty crazy how much time we devoted to trying to one up each other. He always had a slight edge on me, and it drove me crazy. Of course, we ended up getting so good that no one else we knew ever wanted to play with us–talk about counterproductive! 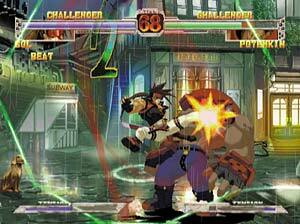 There was also Guilty Gear X, one of the most absurd and fun fighting games ever made, which began each match with the nonsequitur statement “HEAVEN OR HELL” (and yes, it was a statement, not a question). 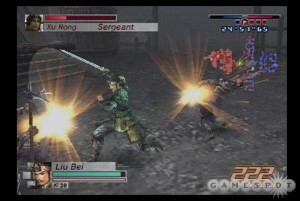 Finally, there was Dynasty Warriors 4: Empires. This game has a Risk-like conquest element, which is really just an excuse for you to kill hundreds and hundreds of soldiers. It is a truly addictive game, which we would take turns at until we’d all conquered ancient China, and then begin again. It also featured some of the worst voice-acting, and most awkward fake arm gestures, possibly ever conceived of by any human mind. Kelly and I still play it every so often. A lot of things happened after college. I started seeing someone seriously. I got a job 30 miles from where I lived. I started grad school 40 miles from where I worked. In short, free time suddenly became a lot more scarce, and what time I had I wanted to spend with my better half. It worked out really well–I finished grad school, got an even better job, and we got engaged. But during this whole time I barely played any video games at all. Even putting all that aside, my gaming was already waning. In college, it was my younger brother, not I, who went out at some crazy hour of the morning to wait in line to get the Wii when it first came out. And he had to do this many times before he actually got one–he was very dedicated to his goal. When I moved out, I left my consoles with my siblings because I knew they would get more mileage out of them than I would. At that point I was too busy doing–well, just about everything else. I have slowly started trying to reconnect with my gaming roots. I reclaimed the old N64 at my parents’ place, and I play it every so often. The biggest pusher in my life is my brother, who gave me Starcraft II two Christmases ago and Portal 2 this Christmas. Circumstances have made me into a PC gamer–not that I’m complaining! Those are some excellent games. I suppose I’ve just come to realize that being a gamer is an important part of who I am, in the same way that being a sports fan is an important part of a lot of people’s lives. One does not have to acknowledge video games as an art form in order to recognize that gamer culture is culture. There are creators and critics, consumers and commentators, and above all, communities. We live in an increasingly interconnected age, but we gamers knew of communities of interest long before we took to the web. Some of the greatest and longest lasting friendships I’ve ever had have been cemented through gaming. Now we’re online, connecting to one another in unprecedented numbers, and having a ton of fun doing it!